It’s winter. We can either crawl under a quilt and snuggle till spring, or embrace mother nature and her frosty disposition. If you’re like me, you choose to celebrate this season of chapped lips and pink cheeks. Donning knit cap and gloves, you may even stick out your tongue as the fat, juicy snowflakes swirl around you. And some of the best snow on earth is a short flight from Oakland – in Utah. Just an hour from Salt Lake City, Olympic Park is the epicenter of your winter experience. Here, the 2002 winter games are still fresh in the minds of the people who visit, and training goes on here, year-round. But if you’re not content to see someone else have all the fun, you can try some of the sports yourself. Take the bobsled, for instance. For 200 dollars, you can go flying down the Olympic bobsled run at speeds of up to 80 miles per hour. With a certified driver and 2 other riders, you whisk around 15 curves and descend almost 40 stories in less than a minute. It’s the most jaw-dropping, bone knocking ride you can imagine and there is no denying, it’s fun. Then there’s freestyle ski jumping, a sport that only a human pretzel can love. You can learn this here too, with instructors who teach on terrain parks in winter and special ramps in summer that have you jumping into an aerated pool. The bubbles cushion the blow when you land with your skis in a tangle and arms all akimbo. But with just a few lessons, you may even learn to stick your landing. Now I know what you’re thinking. Is there anything in the area that’s a little more – tame? The answer is yes, with two world class facilities for skating and cross country skiing. Framed by the rugged Wasatch Mountains, Soldier Hollow was the site of the 2002 Cross Country and Biathlon events. You can just picture the scores of spectators lined along the tracks to watch the competition. 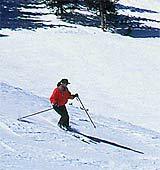 Today, you’ll find youngsters to seniors navigating these 21 miles of trails, with state of the art rental skis and terrain for all skill levels. But even more challenging is the combination of skiing and shooting called Biathlon. Imagine skiing around the track to the air rifle range, where you drop to your belly and take aim. Your legs in a V- shape behind you, the trick is to steady yourself and stop shaking long enough to hit the target. But not everything here mirrors the Winter Games. You can rent snowshoes and explore some of Soldier Hollow’s 600 plus acres of woods and meadow. You may even see a moose along the way, or some of the other wildlife that calls Utah home. For the young at heart, try plopping your body into a big rubber tube and sliding down the hill. Soldier Hollow has the longest Snow Tubing lanes in the U-S – and a tow lift to take you to the top. Even a certified couch potato could learn to like this “sport”. The final crown jewel in Utah’s Olympic experience is the Oval Ice Skating Rink. Called the fastest ice on earth, you can lace up your skates and feel the wind in your hair as you fly around the same 400 meter speed skating track the Olympians used. And setting your sites for loftier goals is as easy as skating up to the aerial bungee stations. Much like it sounds, you’re lifted 25 feet in the air for a chance to do back flips and other trick maneuvers before making a soft, gentle landing. It takes no experience – just strong will and nerve. The 2002 Winter Olympics have forever changed Salt Lake City and its surrounding area. They have world class training facilities now, which American athletes will use for decades to come. We can use them too – making Utah one of the best family vacation destinations in any season.